The Dickey Broadcasting Company and Major League Baseball’s (MLB) Atlanta Braves announced today a new multi-year partnership with Skyview Networks to serve as official radio network provider. Skyview, an integrated professional sports broadcasting company, will provide satellite distribution services and next generation smart receivers across the Atlanta Braves radio network—the largest in MLB. "We chose Skyview Networks as our distribution partner because of their great track record in reliability and their operating platform tailored to sports content. We look forward to a long relationship with Skyview and the dependability they bring to the Atlanta Braves Radio Network and Dickey Broadcasting," said Jim Mahanay, Operations Manager of Dickey Broadcasting. In February 2010, Skyview began deploying next generation smart receivers across the Atlanta Braves Radio Network of 134 affiliates. This technology, coupled with Skyview’s automation and inventory management systems, allows Dickey Broadcasting the ability to localize and regionalize advertiser messaging. It also offers the affiliate network the ability to time shift, store and forward programming and perform copy split-spot insertion. The Atlanta Braves radio broadcast hosted by Jim Powell and Don Sutton can be heard on the Atlanta Braves radio network and its flagship stations, 680 the Fan, WCNN-AM and Rock 100.5, WNNX-FM. For more information on the Atlanta Braves 2010 season, visit http://atlanta.braves.mlb.com. Skyview will broadcast the first network-wide Atlanta Braves regular season game Monday, April 5, 2010. Skyview Networks currently provides the broadcast services for over 40 professional and collegiate sports organizations and produces and delivers Arizona and California Headline News. Founded in 1995, Skyview is based in Scottsdale, Arizona and focuses on providing broadcast network solutions to professional and collegiate sports and syndicated radio shows. Skyview’s services include satellite distribution, full network automation, affiliate relations, inventory management systems and advertising solutions for radio, television, print, signage and web. 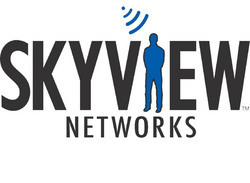 For more information, visit http://www.skyviewnetworks.com.